Globe's live auction aims to raise funds to support the development of our new contemporary arts venue in Newcastle. 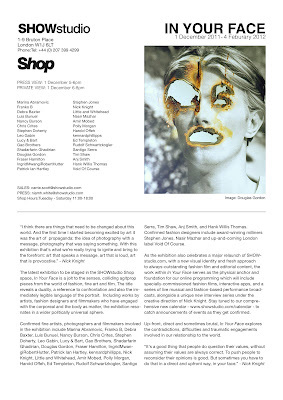 With more than 60 artworks generously donated by artists including Douglas Gordon, Mike Nelson, Mark Fairnington, Jane & Louise Wilson, Franko B, Stefan Gec, Simon Leahy-Clark, Fiona Banner, John Kippin, Fiona Crisp and many others, and with prices for everyone, this is a not-to-be-missed evening. All proceeds from the sale of the artworks will go towards continuing the development of our innovative programme of exhibitions, projects, artist support, community and school workshops, and our range of award winning volunteering opportunities. 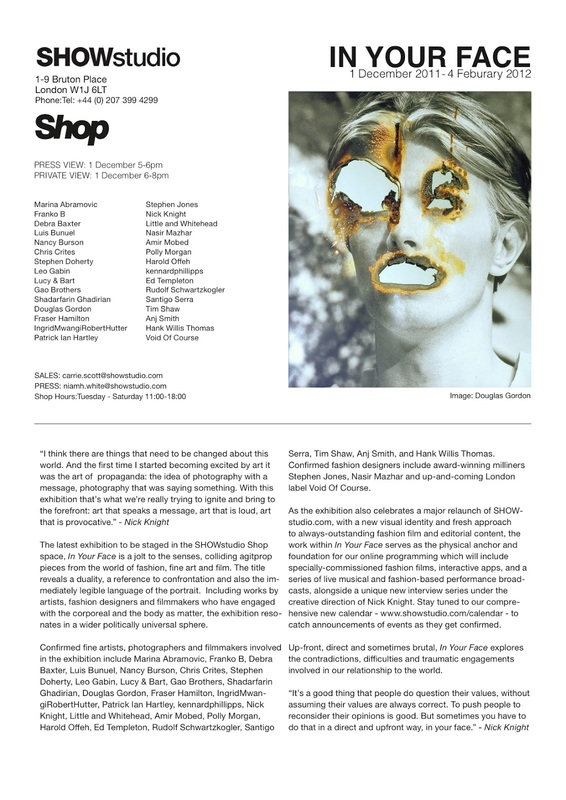 IN YOUR FACE - Group exhibition at Show Studio, 1-9 Bruton Place, London W1J 6LT. Private view 1st December, 6-8pm. Exhibition continues until 4th February. Tues-Sat, 11am - 6pm. Franko B will perform I'M THINKING OF YOU at GRÜ, Geneva on November 25th. More information and tickets here. Includes an interview with Richard Smith from Peter Scott Gallery, Lancaster, who talks about Franko B's recent solo exhibition, SOMEONE TO LOVE. Listen here (Richard Smith interview starts approximately half way through).